Capture beautiful images of coral, pygmy seahorses, and blue-ringed octopi with this Ikelite Underwater Housing and Sony Cyber-shot DSC-WX500 Digital Camera Kit from B&H. The durable polycarbonate enclosure enables you to descend as far as 200' beneath the surface. Its mechanical controls afford access to virtually all the functions of the WX500. Additionally, it's equipped with a flat glass port for the camera's Zeiss Vario-Sonnar 24-720mm f/3.5 lens, which features 30x optical zoom. 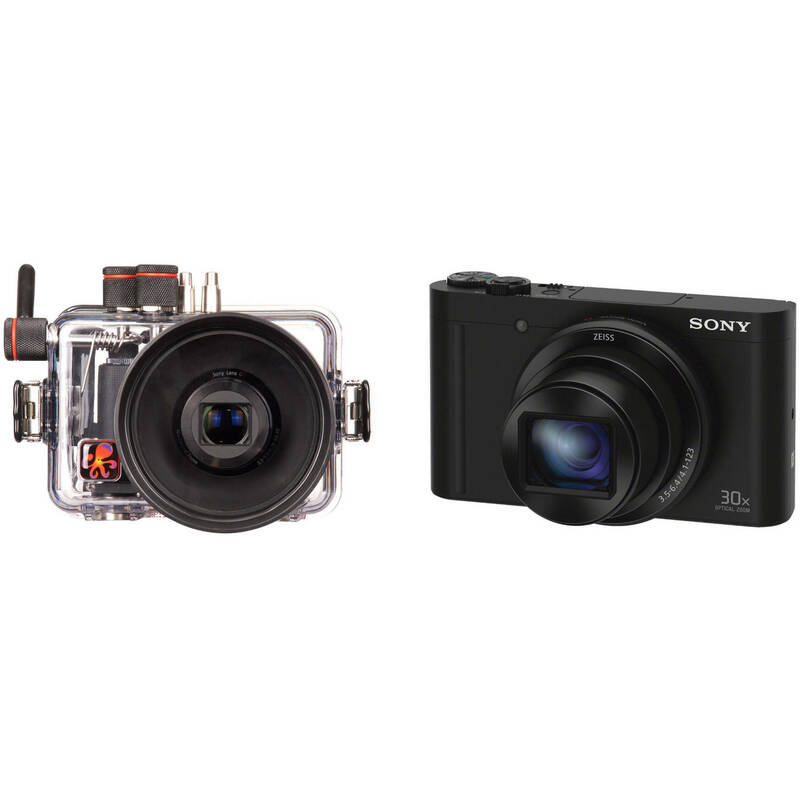 Capture images and video at depths up to 200' beneath the surface using this Ikelite Underwater Housing for the Sony Cyber-shot DSC-HX90 or DSC-WX500 digital camera. Large, ergonomic mechanical controls provide access to virtually all camera functions. The enclosure's dual built-in fiber-optic ports allow for the attachment of optional Ikelite, SEA&SEA, and Olympus-type strobes via cables. Alternatively, the housing is also compatible with the optional wireless AF35 strobe, which replicates TTL exposure. Both the fiber-optic and wireless connections rely on the firing of the camera's built-in flash to trigger a strobe. Additionally, a flash diffuser and deflector are supplied. Built for durability, the housing is designed, made by hand, and tested in the USA. Manufactured from durable, clear polycarbonate, it resists corrosion and allows you to maintain a full view of the camera while monitoring the O-ring seal. The integrated, flat glass lens port has a 3.9" diameter and accepts optional wide-angle and macro add-on lenses, as well as color-correction filters. The camera features a 180° tilting 921k-dot 3" LCD screen for shooting at various angles. Optical SteadyShot Hybrid image stabilization reduces shake and blur by countering camera movements on 5 axes. Box Dimensions (LxWxH) 9.8 x 6.5 x 6.4"
Box Dimensions (LxWxH) 6.1 x 4.7 x 2.7"